Monday will be a cold one. Temperatures are going to limp into the mid-30s. If you’re lucky, you’ll see upper-30s Monday afternoon. We’ll have a mix of clouds and some sun. No wintry precipitation should occur Monday. A weak disturbance Monday night may increase clouds and moisture well south of Houston (toward maybe Freeport, Matagorda, or Palacios). If that happens, a little freezing drizzle or sleet would be possible Monday night into Tuesday morning in those areas. We think this will avoid Houston. If something changes, we’ll let you know. Monday night into Tuesday morning looks really, really cold. Expect a hard freeze over much of, if not most of the area. But exactly how cold we get will depend on how much cloud cover we see. If we end up partly cloudy or mostly clear, the temperature forecast above will verify without much trouble. If we see more clouds than expected, you can probably add 2-4° to temperatures, especially in Houston and south of I-10. But I would plan based on these colder forecast values. 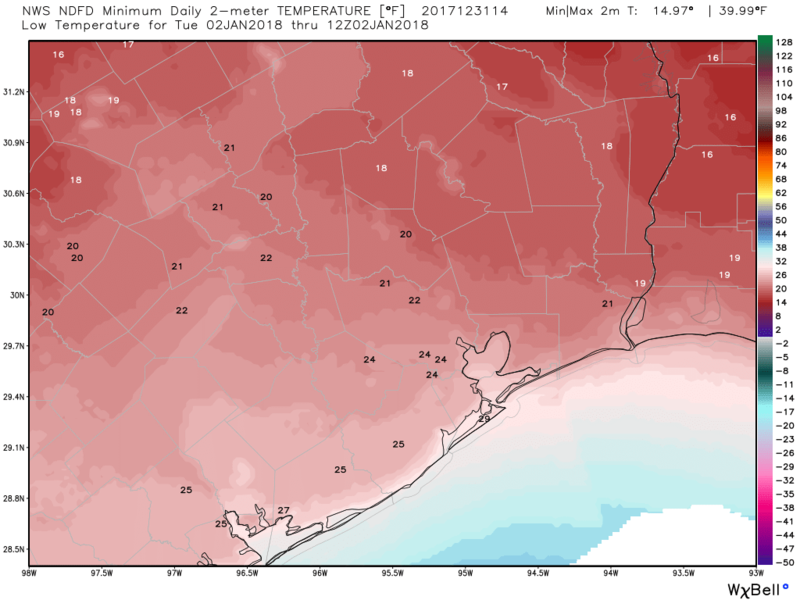 Expect mid-20s south of Houston to the bays. Mid to upper-20s will be the rule on the beaches. In the city of Houston itself, we should be able to get into the low-20s north and low to mid-20s south. 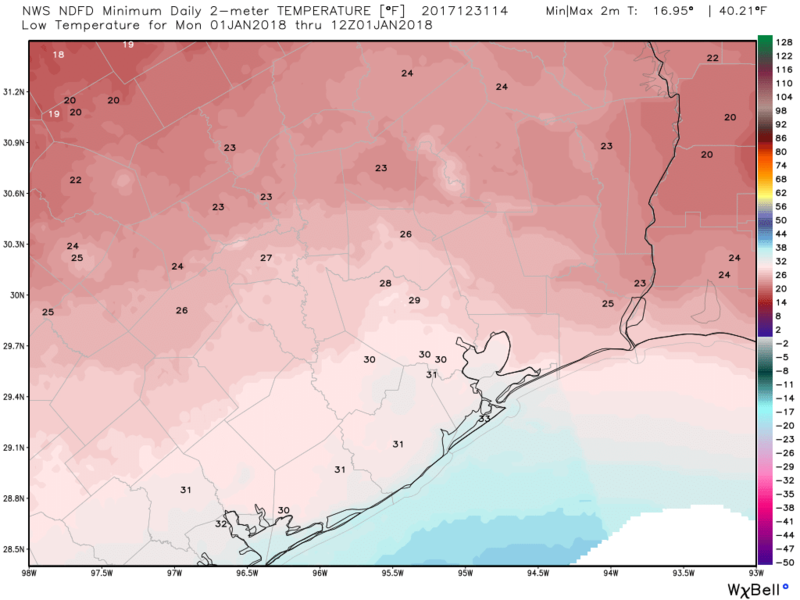 For The Woodlands, Spring, and Tomball, expect low-20s to around 20° by Tuesday morning. North of there, toward Conroe and Huntsville, expect upper teens for lows. Tuesday will be another cold day, with temperatures struggling to reach the mid or upper-30s. Tuesday night into Wednesday morning will be very much in hard freeze territory again. We could end up colder than Tuesday morning depending on how cloud cover pans out tomorrow night. Skies Tuesday night into Wednesday should clear out, allowing for temperatures to plunge, or what we call “ideal radiational cooling.” The only ingredient we lack is a fresh snowpack. Guess we can’t be greedy. 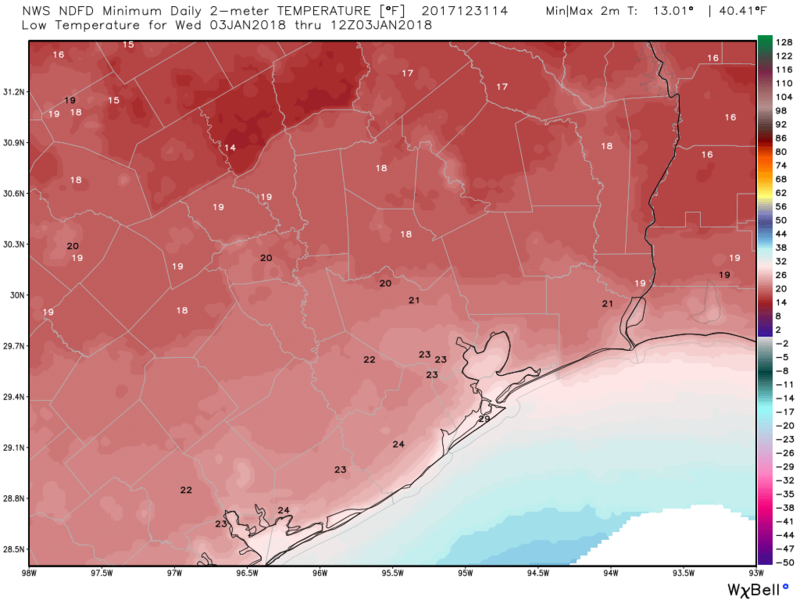 Expect teens from The Woodlands north, low-20s in Houston, and low to mid-20s south of Houston. Beyond Wednesday, we could have one more hard freeze Thursday morning (especially north of Houston) before temperatures finally start to warm up. 60° is going to feel downright balmy by Saturday. Eric and I will update you tomorrow if needed, but we don’t expect a ton of changes right now. Assuming that’s the case, look for our normal morning updates to resume on Tuesday. Have a safe and happy New Year! Happy New Year to the Space City Weather folks! Meet Eric Berger, leisure-time meteorologist, predictor of Harvey’s floods, unlikely hero. I just got back from visiting SW Pennsylvania for Christmas. It was unusually cold there, with lows getting into the single digits. So, a few days of 20s and 30s will feel quite comfortable in comparison. 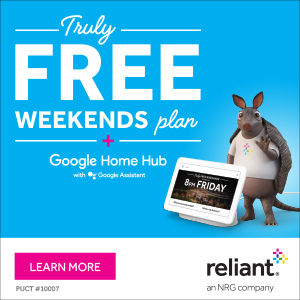 My question is: when Houston was built in the pre-global warming days, and, cold winters were much more common, what did people do in these old, drafty houses with exposed piping? Did they spend most of the winter bundled up even inside, and spend all day trying to keep pipes warm? Why would a city be designed that couldn’t withstand the typical local winter? Go back to Pennsylvania, carpet bagger. That is rude and unnecessary. It’s also downright stupid. If you were paying attention you would notice that Matt, the author, notes that he is from the north so if you hat carpet baggers so much you probably shouldn’t be reading this blog. For the same reason this city doesn’t have salt or sand trucks: that it’s a huge level of effort and expense for something that realistically only happens for fewer than 14 days of the year. Even in the pre-global warming days, the city never got THAT cold for THAT long. Letting the pipes drip or shutting them off, draining the water, and waiting it out is inconvenient but far less expensive and less effort than pipe insulation was for older houses (anything built before 1965 or so). Yeah, I mean Houston’s longest streak of sub-32 was 11 days back in 1983. And the winter with the most 28° or colder (hard freeze territory) mornings was 1978-79 when we had 17. We average about 4-5 per year (including the old days) so as said, I guess it’s more about cost vs. benefit. Thanks for the update !!! Happy New Year to all !! Be safe please, if you are out and about on New Years Eve !! Thank you for all your reports, so helpful and enjoyable to read! Happy and Healthy New Year to you at Space City Weather! Thank you for your timely information. Thank you and Happy New Year! This site’s success is inspirational. If I may trouble you, how does the forecast look for driving home to Houston from New Orleans tomorrow afternoon via I-10? Doubt you have any issues. Just cold, sun, and clouds with a gusty north wind maybe blowing the car around the road a bit. Thanks for reading! Hard freeze in the area South of Eye 10? “…Houston’s longest streak of sub-32 was 11 days back in 1983…” If I recall correctly, it started on or about Christmas day and I was with my Boy Scout troop at Winter camp (Camp Karankawa down in Sweeny) the whole week. Earned a Igloo segment patch for overnight camp out in sub 32 degree weather. It was one of the best weeks camping except for the morning flag ceremony before breakfast. Just curious. What is the definition of a “hard freeze”? Certain length of time at a certain temperature? Check the 1988-89 freeze that saw temps as low,as 17oF for something close to 5 days straight, with highs below freezing.. The metro area ran out of plumbing supplies. People returned from their nice Christmas vacations with amazing amounts of water leak damage and water bills over $1,000. Thank God fir modern plumbing! And do let us not forget that in original form, global warming was going to lead to less snow and lighter winters. By the way, it is 710am Tuesday morning, 2nd of January and SW Houston has had either a light freeze or no freeze at all. May we have a flood free, hurricane free year ahead. Thank you for taking the trouble to help me.I do appreciate it.